Two soldiers murdered in grisly terror attack identified as Yuval Mor-Yosef and Yosef Cohen from the Netzach Yehuda-Nahal Haredi Battalion. 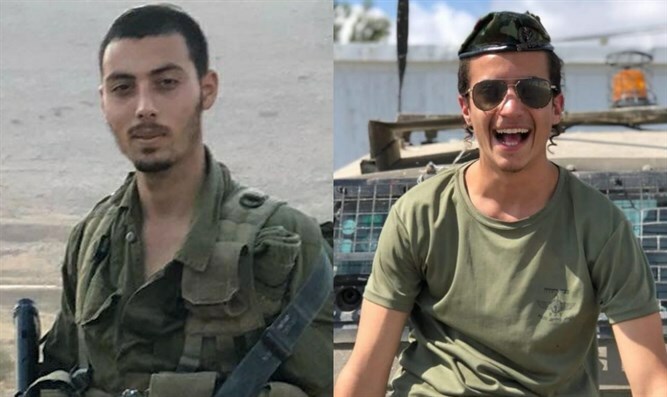 IDF combat soldiers Sergeant Yuval Mor-Yosef, 20 from Ashkelon, and Corporal Yosef Cohen, 19 from Beit Shemesh, were identified as the soldiers who were killed today during the shooting attack at Givat Assaf on Thursday. Both Mor-Yosef and Cohen were combat soldiers in the Netzach Yehuda-Nahal Haredi Battalion. Mor-Yosef was posthumously promoted to Staff Sergeant and Corporal Yosef Cohen was posthumously promoted to Sergeant. Their families have been notified. Shira Sabag, who was seriously injured, was operated at Shaare Zedek Medical Center and her condition is defined as serious yet stable. Sabag is fully conscious and has already met with her parents. An initial investigation revealed that the terrorist arrived at a hitchhiking post at Givat Assaf with his vehicle before stepping out and opening fire at those assembled there. The two soldiers were killed immediately by the gunfire at point blank range while the other soldier and Sabag were injured. The terrorist then fled towards Ramallah, where he abandoned his vehicle. The IDF and Shin Bet have launched a massive manhunt after the terrorists and are conducting searches in a number of villages.